Natalie Rebot is a Google software engineer turned entrepreneur that created a new device which can be used with your smartphone to upgrade traditional bedtime story telling. Moonlite is described as the first mini bedtime story projector reader that attaches to almost any mobile phone and uses its flash to project imagery onto any surface. The idea grew organically from Natalie’s bedtime ritual with her 3-year-old daughter, Chloe. After using the flash on her smartphone to create shadowplay. It wasn’t long before she realized that she could take their routine to another level to create stories and scenes using her phone and innovative design. Natalie first appeared on my podcast 2 years ago on episode 160. 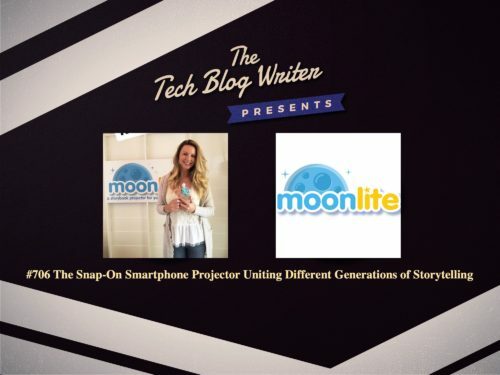 Following a massively successful launch on Kickstarter.com, Moonlite, the #1 children’s reading toy, is back on Kickstarter with a brand new limited-edition Rose Gold story projector, all in efforts to help strengthen children’s literacy across the nation. I invited Natalie back onto my tech podcast to hear more about her journey from initial prototype and concept on Kickstarter to reach 60 million views the product’s original video. Tapping into that existing momentum, the brand is setting out on a mission to raise awareness of the benefits of reading and ultimately give back to the community. To achieve this, Moonlite is partnering with Baby2Baby, a non-profit organization that provides children living in poverty with diapers, clothing and all the basic necessities that every child deserves. For each Rose Gold Moonlite pledged for, Moonlite will donate the equivalent of 10 books to Baby2Baby with the goal of bringing the magic of story time to over 60,000 low-income children this holiday season.